The Eagles locked up a pair of specialists today on one-year deals. Both Elliott and Lovato were exclusive-rights free agents, meaning they weren’t going anywhere and their re-signing was somewhat of a formality, as long as the Eagles wanted them back. Both players will now be restricted free agents next year. 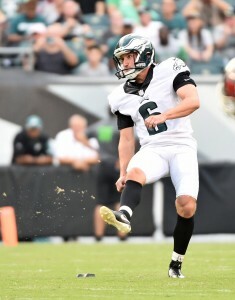 The Eagles picked up kicker Jake Elliott from the Bengals’ practice squad to replace the incumbent Caleb Sturgis after he suffered a hip injury the first week of the season. The team hasn’t looked back since then and it looks like Philadelphia has no plans to change their special teams unit moving forward. While Sturgis is eligible to come off the disabled list this week, Eagles special teams coach Dave Flipp told reporters today that, “right now there’s no reason to make a change,” reports Zach Berman of The Inquirer. It’s understandable why the team would not feel the need to mess with the status quo. Elliott has made 17-20 of his field goal attempts this season, but is best known for his 61 yard bomb he hit to beat the Giants in Week 3. The Redskins have a few big names that are questionable to play for the team’s game this Sunday. Defensive lineman Matt Ionanidis has already been ruled out for the team’s affair vs. the Vikings, but offensive stalwarts Trent Williams and Jordan Reed are listed as questionable to play too, according to Jonah Keim of ESPN.com. Washington has 11 players listed as 50-50 for Sunday with other offensive lineman Morgan Moses (ankles), Brandon Scherff (knee), Spencer Long (knee/quad) and Ty Nsekhe (core muscle). It’s unlikely that the majority of the Washington offensive line will miss the game, but the team’s depth is something to keep an eye as we get closer to kickoff. The Saints will be without a key member of the defense vs. the Bills this Sunday. Saftety Kenny Vaccaro will miss the contest with a groin injury, but expressed optimism that the situation will be more of a short-term issue, reports Mike Triplett of ESPN.com. The 26 year-old defensive back told the reporter, “Oh, yeah, I’ll be fine,” when referring to the timeline of the groin issue. Meanwhile, while New Orleans will certainly miss their starting safety, the team has a considerable amount of depth at the position with the likes of Vonn Bell, Rafael Bush and Chris Banjo all likely getting playing time in his absence. Cowboys third-string tight end Geoff Swaim missed practice on Friday with a right knee injury and as is waiting on MRI results that should bring light to what his recovery may look like, reports Todd Archer of ESPN.com. Archer opines that Swaim could miss Sunday’s game and may be in line for arthroscopic surgery, which would sideline him for a few weeks. Swaim just has two receptions on the season with Jason Witten and James Hanna getting most of the reps in two tight-end sets. Caleb Sturgis‘ injury looks to have prompted the Eagles to pry a kicker off another team’s practice squad, and they’ll be adding one of this past draft’s top kicking prospects. The Eagles intend to sign rookie Jake Elliott off the Bengals’ taxi squad, Ian Rapoport of NFL.com tweets. Sturgis’ quad strain will send him to IR, with a potential designation to return, per Rapoport. The Bengals opted to go with Randy Bullock as their primary kicker but attempted to stash Elliott, a fifth-round pick out of Memphis, on their practice squad. But the Eagles’ injury need will relocate the kicking prospect. Three kickers went in this past draft, and the other two — Zane Gonzalez and Harrison Butker — were seventh-round selections. So, Philly will have an interesting specialist filling in for Sturgis — also a former fifth-round pick — who has kicked with the team for the past two seasons. Elliott broke Stephen Gostkowski‘s Memphis records for points scored and field goals made in a career and was a Lou Groza award finalist in 2015. The Eagles are on the lookout for a kicker. Caleb Sturgis suffered a hip flexor strain on Sunday, as Jeff McLane of The Philadelphia Inquirer tweets. The injury will rule him out for four weeks, ESPN’s Adam Schefter tweets, and the team is already making plans to look at replacements. We don’t know who will be working out for the Eagles just yet, but Mike Garafolo of NFL.com (on Twitter) suggests that free agent Mike Nugent could get a look. Bengals practice squad kicker Jake Elliott could also get a call, Ian Rapoport of NFL.com tweets. Sturgis, 28, made all three of his field goal tries on Sunday, including a 50-yard attempt, but missed one of his two extra point tries. Last year, he sank a career-high 85.4% of his field goals and went 30-for-31 on XPs.